If you’ve been playing with your iPad at all, you know, despite Apple’s claim that iPads have fingerprint-resistant screens, that iPads are fingerprint magnets. They are covered with an oil-resistant coating, but that definitely doesn’t mean they are smudge-proof. There is a ton of information on how to clean iPad screens, however some methods don’t actually work. To clean your iPad screen, you can use common household items such as dry cloth and water. You never want to use any cleaning product such as Windex or any chemical-based cleaning solution. Microfibers are typically your best solution as these not only remove fingerprint marks, but also are lint free and scratch resistant! Soft cloth. You can get most fingerprints off with a dry, soft cloth such as the one you use to clean your eyeglasses or a cleaning tissue that is lint- and chemical-free. Soft cloth and water. If you want to get the surface even cleaner, you can use a soft cloth that has been slightly dampened. Again, make sure whatever cloth material you use is free of lint. If you don’t want a fried iPad, turn it off and unplug any cables from it before cleaning the screen with a moistened cloth. Avoid getting too much moisture around the edges of the screen where it could seep into the unit. It definitely isn‘t wise to use premoistened lens-cleaning tissues to clean your screen. Most of these wipes contain alcohol, which can damage the coating. Your screen isn’t the only thing on the iPad that can be damaged, so it isn’t a bad idea to get a case for it so you can carry it around the house or around town safely. Besides providing a bit of padding if you should drop the device, a case makes the iPad less slippery in your hands, offering a better grip when working with it. Several cases came out pretty much the day iPad shipped, and more are showing up all the time. You can choose the neoprene one offered by Apple or those from other manufacturers that come in materials ranging from leather to silicone. Cases range in price from a few dollars to $70 or more for leather. Some provide a cover, and others protect only the back and sides. 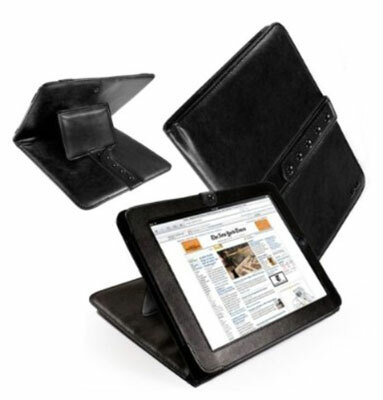 If you carry your iPad around much at all, consider a case with a cover to provide better protection for the screen or use a screen overlay.